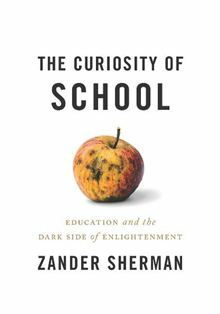 Here's my interview with Zander Sherman about his book The Curiosity of School: Education and the Dark Side of Enlightenment (Viking, 2012). The book tells the story of institutionalised education, from the early-mid 19th century all the way up to the present. It covers topics such as standardized testing, the role of corporations in higher education, and the growing student debt crisis. Throughout, Sherman recounts the ways in which school has been used to manufacture outcomes—to turn students into soldiers, citizens, and human capital. The Canadian writer and novelist Will Ferguson described the book as “provocative in the purest sense of the word – meaning, it makes you think; provokes discussion – while never overstepping the bounds of reason”. Sherman was homeschooled until the age of 13, has worked as a freelance writer, and currently lives north of Toronto. A PDF of the interview can be downloaded from here for free. (1) What motivated you to write a book about the story of school? And why did you decide to call it 'The Curiosity of School'? At the high school I attended there was a student population of about a thousand, but the cafeteria could only hold five hundred. At lunchtime, half the school would take its meal sitting in the halls. If the administration caught us sitting they would tell us to stand, saying it was against "fire-code regulation." That made no sense to me. In the event of a fire, who was going to stay sitting? Looking at that policy began a long process of investigation and research. School is strange because we spend so much time there, and accept its value as a thoroughfare to work, while having little awareness of what it actually is, where it came from, and why we use it the way we do. I wanted to write about the story of school with the belief that doing so would shed light on the institution itself: the qualities that make it a "thing"--an institution that has a history that's shocking, dark, and sometimes quite funny. It's called The Curiosity of School because we learn a lot of things in school, but never what school "as a thing" really is. (2) What are some of the most surprising discoveries you made in researching the story of school? The most surprising discovery was that the history of school is a testament to one long experiment in social engineering. We look at students as raw material. This has been the mindset since the beginning of the twentieth century. The idea that an education should lead to something practical involves the assumption that learning for its own sake has little or no value, which represents a view that I would broadly characterize as pragmatic. My point here is simply to acknowledge this, as well as perhaps to indicate that educational pragmatism evolved historically out of a desire to shape and direct populations. The point of institutionalized education has never been to benefit the student for his or her own sake, based on the understanding that the activity of learning is an intrinsically worthwhile endeavour. (3) What is school for? Does it provide students with an education? It depends on what we mean by "school" and what we mean by "an education." School as an institutional artifact--which is my focus in The Curiosity of School--arose from the impetus to turn people into things, not necessarily to help awaken their sense of passion and curiosity, which (in my view) are vital to the acquisition of knowledge and wisdom. (4) In his essay 'Against School', John Taylor Gatto argues that schools are places where children are encouraged to never grow up, "virtual factories of childishness." Do you agree? I think many people would say just the opposite--that schools don't recognize the importance of childhood and artificially or unnaturally accelerate this stage of life in order to produce human capital. Of course it depends very much on what kind of school system we're talking about. The more institutionalized methods of schooling have historically been less tolerant of childhood. In fact, some of the so-called "child-centred" pedagogies such as Montessori and Waldorf arose in opposition to what was seen as an industrial way of looking at children--namely that the child represents the raw material and the adult represents the completed product. It also depends on what we mean by childhood. The alternative models may be more tolerant of childhood according to how they see it, and more respectful to children as they see them, though other people may find these views in conflict with their own. With a topic like education there is a great deal of subjectivity! It seems very hard for people to agree on what it looks like and how it works, let alone what it should look like and how it should run. (5) Were people better educated before the modern education system came into existence? The case could be made that institutionalized education--what we're now calling school--has negatively affected people's sense of passion and wonderment. In The Curiosity of School I was less interested in making this argument myself and more interested in providing the means by which it could be made (along with plenty of other arguments) by other people. The story of school was what interested me, not how that story might be used to support a particular viewpoint or opinion. (6) You reveal that you were homeschooled until the age of 13. Do you think it is better to educate at home than at school? I do not personally support any one system or method of schooling in particular. If I did, I think I would be forced to concede that I thought all people learned in the same manner, which does not appear to be the case. People behave differently and have different perceptions about the world around them. As a result they tend to learn in different ways. Some people are great with ideas and abstract concepts; for others, life involves a greater degree of tactility and sensory experience. Countless more distinctions could be made. Advocating one overarching approach seems not only to ignore these differences but to take a very broad view of what an education should do, how it should look, and where it must take you. Ultimately I believe that people should pursue the methods of learning which engage, challenge, and reward them in ways that are unique to their natural cognition and behaviour. (7) What's the purpose of private schools? And are they better than public schools? One of the longest-standing debates in education is whether private schools are better than public ones. Of course, there is some contention surrounding the definition of "better" as it relates to the field of education. The traditional definition means "a superior quality of education." With this in mind one can indeed find a certain amount of literature to support this claim. However, there is a roughly proportional amount of opposing literature that suggests just the opposite. In other words one can, using scholarly sources, make the case that private schools are educationally superior or educationally inferior to public ones. In my book I recounted some of this debate while pointing out that the original point of private education was to form a social elite. I think it's fair to say that some private schools continue to view education as a method of social engineering. (8) What kind of an education system would you like to see replace the current dominant one? A new model that would interest me is one in which education is treated as something that has intrinsic value. The point of going to school isn't to get a piece of paper--it's to receive knowledge that leads to wisdom. And really to inspire people and engage their sense of curiosity. It's pretty clear that the present model is not dependably successful in this area, and equally clear that education is too valuable to the human enterprise to be conflated with social engineering and the manufacturing of outcomes. "Getting an education" could be seen as a lifelong process, something that doesn't begin and end with schooling but continues in- and outside of the classroom, with- or without the assistance of policymakers, teachers' unions, and educational administrators. We are always learning, wherever we go and whatever we do. A new educational system could begin by recognizing this and treating it as the very centre of its purpose. (9) What are some of the negative consequences of having a school system that regards education as a means to an end and not an end in itself? If we treat education as a means to an end I think it will lead to a culture in which curiosity isn't valued--and in some instances even squandered and driven out of people who are naturally curious. Today the point of going to school is to get a job. The point of getting a job is to make money. I don't mean to suggest that I'm against work, or against capital, merely that these things should be the natural byproduct of an education, not its whole point and purpose. A curious mind will want to explore and invent and be highly creative. In my book I draw together some of the information required to suggest that treating an education as its own reward could have the inadvertent consequence of leading to a society that is more creative, more productive, and richer in many ways than the one we have now. (10) In his forthcoming book 'Underminers', Keith Farnish writes: "No system that is so mentally nourishing, and so beneficial to the individual as school system's promoters claim, would need to compel, by law, anyone to attend on a regular basis. They would just go." Do you agree? Compulsory schooling is one of the main factors of institutionalized learning; it originated out of the intent to standardized the educational experience, making it easier to funnel and shape populations. I don't personally see the educational benefit of legally enforcing students to attend school. Those who benefit from school will probably go there anyway, just as those who don't will find a different way to learn. This interview was conducted by Richard Capes and completed on 30th January 2013.